Hand-waxed with a custom beeswax blend, this lovely pouch can also take a beating. While you're admiring the lovely lunar pattern that graces this pouch, consider a practical note from makers Leah and Cody Seelye: "Our bags can withstand a beating." Handmade from waxed cotton canvas, they're tough, water resistant, and stain resistant—not to mention beautiful. Leah and Cody prepare their own canvas using a beeswax blend they custom formulated. Great for pencils, cosmetics, and small essentials, the zippered pouch is a handy organizer for your daily dash or weekend packing. Handmade in Michigan. I ordered this as a gift and had to return it. I was so disappointed by the quality. 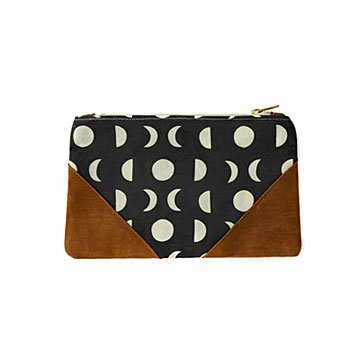 The moon part of the pouch looks like a cheap print. The corners were not quite the same color as the picture and looked more like carhart material. It's also big. I thought the pouch looked small. It's about as big as a medium makeup bag. Just really bummed this didn't look as nice in person! When I saw this I knew this would be a nice surprise for her. Loved this product so much as a gift, I bought one for myself!